Don’t call it a comeback, because THIS mad, murderous Monarch never left. That’s right, Queen Marchesa has clawed her way up the rankings on EDHREC, ending up the 6th most popular deck this week. This didn’t make a lot of sense to me initially, but after doing some sleuthing on EDHREC, it still doesn’t make a ton of sense. These are the new cards. Is Canyon Slough really that exciting? It could be, because another card is making a bit of a comeback and clearly, access to a red-black cycling land is the difference-maker. Let’s take a look at the new stuff in Alesha, Who Smiles at Death. Is Harsh Mentor enough of an impetus to resurrect these decks and build them at a rate they haven’t been built since they were new? Perhaps, but it’s also worth looking at the specific cards that seem to be enabling these two decks, Anointed Procession in the case of Marchesa and Dusk//Dawn in the case of Alesha. 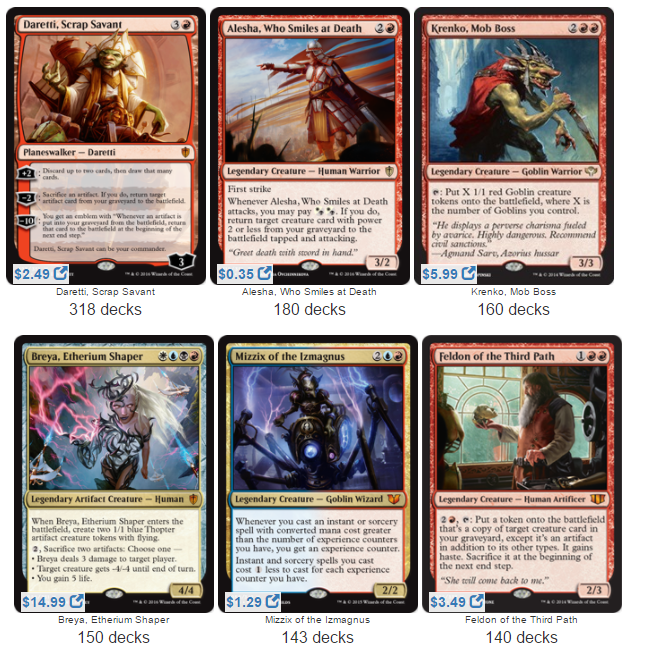 These are basically the two decks bothering with Mentor, although Samut is giving him a try, as well. Is a card like Harsh Mentor enough of an impetus to submit an updated version of your deck so it can get scraped by EDHREC? Maybe, maybe not. But that’s actually a good thing – I think the inertia surrounding what a pain it is to submit a new deck based on one or two new cards is actually a useful analytical tool if we can harness it properly. I’ll explain. If a card is exciting enough for a measurable number of people to either build a new deck or submit an updated version of their deck, that is indicative of a larger phenomenon going on. If only 5% of people will build a new deck or update their deck as a result of a new card, usually that signal will get lost in the noise. 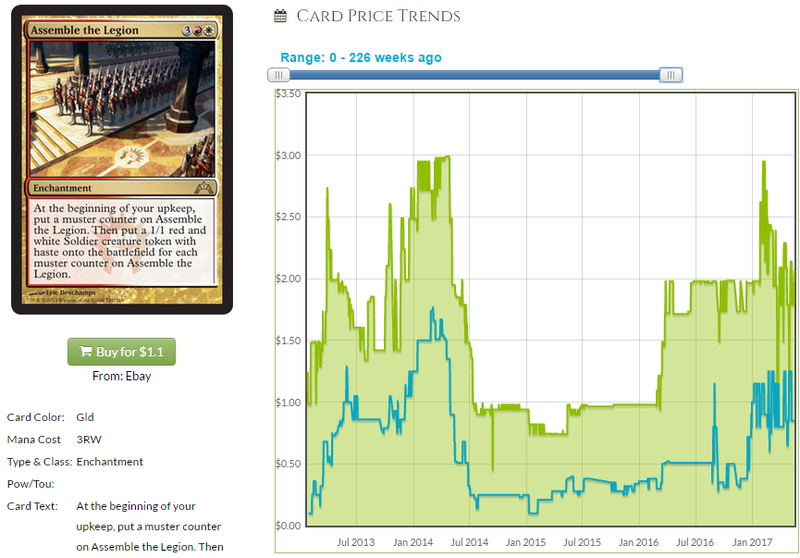 We could, I guess, physically write down the number of decks and check them every week, but EDHREC graphs these trends automatically and by virtue of the changes with the largest magnitude being even picked up by the graph algorithm, we’re automatically filtering out only the information that matters. 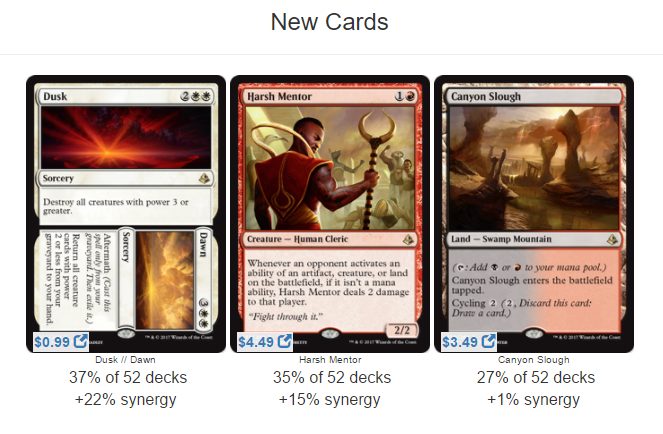 If 5% of people update their decks and a deck shoots up to the 6th-most-built deck when people are still building with Commander 2016 commanders and the new commanders from Amonkhet and no one is really buying Conspiracy 2, that’s a big effect. If we’re graphing it at all, it’s worth noting, right? With Conspiracy 2 being basically unsellable at dealer cost, boxes aren’t really getting popped and the singles aren’t getting any more plentiful. Add to that the fact that Leovold was banned in EDH and therefore for the set to maintain even its current value, something else will have to grow and some of the cards are taking a lot longer than expected to move at all, or even become adopted (I’m looking at you, Regal Behemoth). 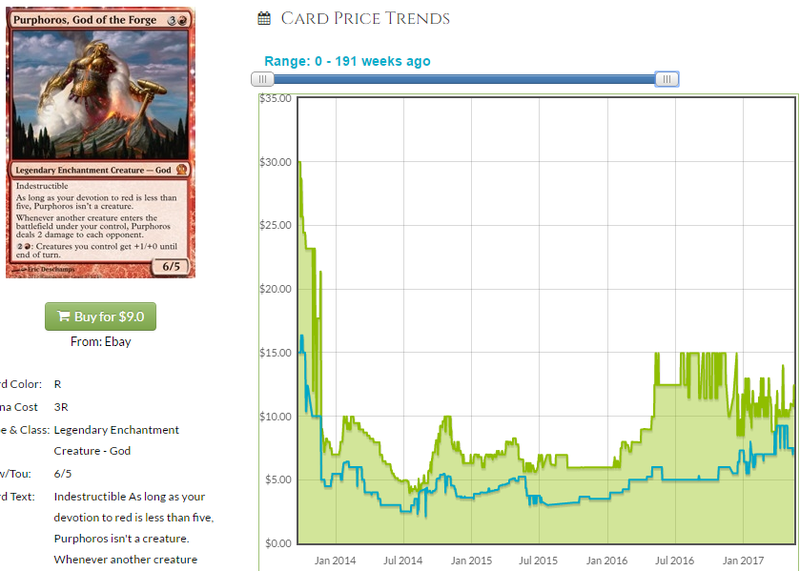 I don’t want to just rehash my article about Marchesa from the first time around but it’s worth re-reading now to see which of the cards have doubled since it was written. I do think there are some cards to look at, though, in the context of the deck being made by people who have access to Kaladesh and Amonkhet block cards. I think the cards I liked in Marchesa are the same as before, but there are new ones to like now. If it’s Anointed Procession that has given us a second look at Marchesa, I think there are some cards you might want to take a second look at. This is down from its historic high which is good because the buylist price isn’t budging. A shrinking spread can only indicate that movement is coming. There is moderate reprint risk for this card, especially since there is a tribal EDH theme for Commander 2017 and red-white soldiers is a real possibility (though how boring would that be?) and this likely gets wedged into that deck. 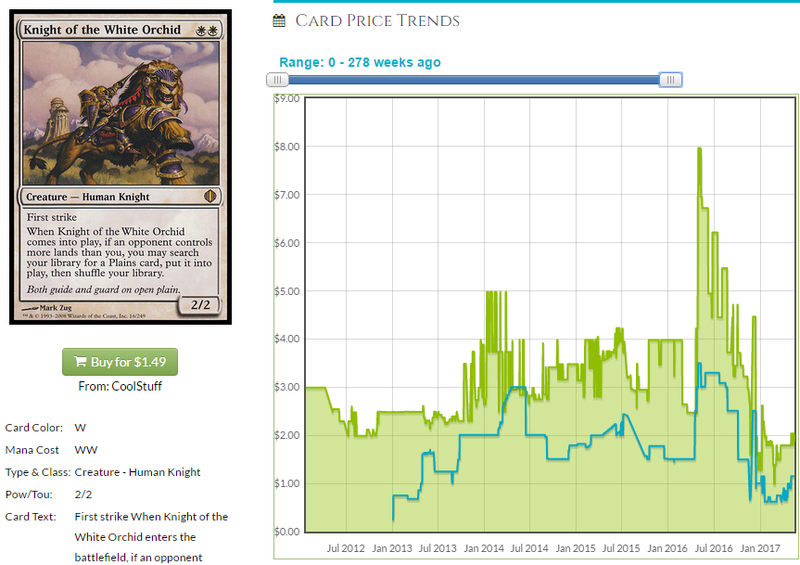 However, I think the reprint would be shrugged off eventually and the risk is low since the buy-in is low. This card is about to do something and I think you want to be holding copies when it does. Marchesa decks are already toying with Anointed Procession because you can get double assassin tokens when you’re not the Monarch and white is probably the second best color for tokens, letting you generate a ton of blockers with cards like Martial Coup so you maintain your Monarch status and get a free Phyrexian Arena. This is one of the best gods and with decks that didn’t have access to Parallel Lives before now beginning to flirt with jamming this guy into decks with Anointed Procession. That’s a pretty good idea, you ask me. The foils are also starting to disappear on TCG Player and with the reprint risk for foils being much lower, that seems like a good bet, especially with the foil multiplier being under 2x. 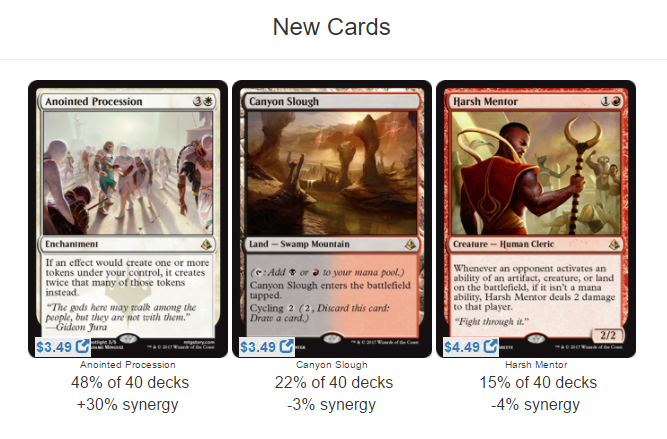 If Procession opens up a few more red-white decks to taking tokens seriously, Purphoros can ride that wave to money town. Graphically, Purphoros looks pretty good and although the buy price appears to be backing off a bit, overall it’s trending toward a lower spread which usually means a retail price correction is incoming. The foils selling out could be what triggers the market, increase in play as a result of Amonkhet making decks that use Purphoros could be a factor, also. All we know for sure is that a god was printed in a Commander precon and all bets are off, making foils seem even safer. It’s not just Marchesa getting more love, either, like I said before, Alesha is getting a second look. Harsh Mentor is much better in the Alesha deck and that’s likely factor for the renewed interest but I think Dusk//Dawn plays a role as well. There have been cards printed since Alesha was new that could get a second look now since people are building or at least updating enough Alesha decks that it caused a blip, so let’s take a look and see if there is anything there. 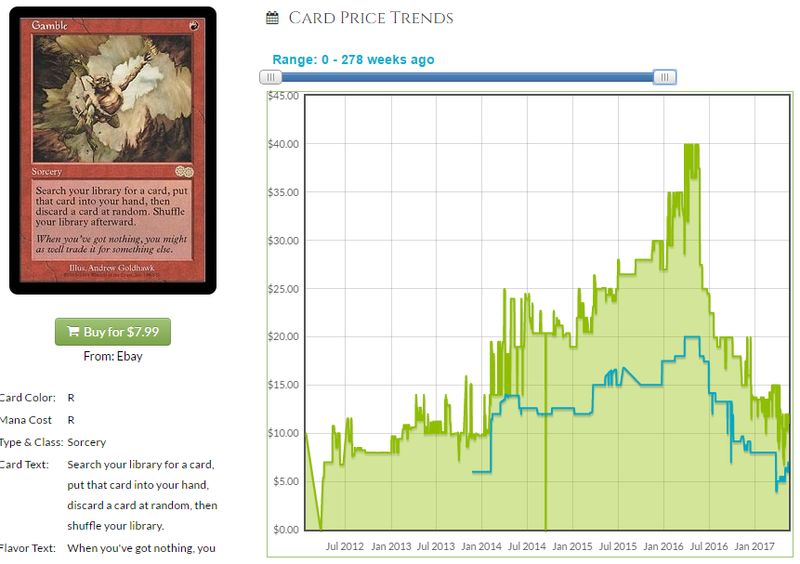 Gamble seems like it was custom made for Alesha decks and the Eternal Masters reprinting has largely done its work. I talk a lot about how I love the look of a reverse-J-shaped graph because you can tell it’s the first half of a U-shaped graph that indicates a price fully recovered. The first half of that graph is great because you can watch the price decline until it’s time to buy in. I think Gamble will recover to roughly half to 3/4 of its peak so buying at the floor, even at $5-$6, seems reasonable. Gamble is no slouch in EDH. This is a card that’s pretty good in some pretty popular decks and gets non-zero amount of eternal play as well. Gamble was a $40 card in a set where cards like Gilded Drake and Phyrexian Tower are only $30, it’s pretty reasonable to assume that a $5 buy-in is pretty safe. This is a mainstay in Alesha and it’s basically at its floor. We’re not likely to get another bout of inclusion in Standard to make this an $8 card again and if we do it will be accompanied by a reprinting, but this has upside and it shrugs off Dusk//Dawn so already it’s worth looking at. Every time a new set is printed, check out EDHREC to see what older decks are impacted by new cards, and keep checking back. It took a few weeks for the trend of an increasing number of Marchesa and Alesha decks to emerge but once I caught, I found quite a few cards I really liked in the context of this new trend. If a deck is being rebuilt and resubmitted often enough to show up as much as new commanders in new decks, it’s definitely worth seeing if you can figure out why and what comes up along with it. $4 Phyrexian Arena? Could be. Maybe not. The important thing is to realize that the data is speaking to us and it is important that we listen. That will do it for me this week. Join me next week where I’ll almost certainly have some more money-making picks for you. Until next time!